Hao village in Hung Yen province nearly 40 km from Hanoi, is busy in preparations, these days, for the upcoming mid-Autumn Festival. The village, with hundreds of years of history, is one of Vietnam’s most famous villages for making traditional toys for this occasion. The Mid-Autumn Festival falls on the 15th day of the eighth lunar month, and is a major traditional festival of many Asian countries. In Vietnam, it is also a special festival for children who are presented with toy drums, masks, star-shaped lanterns, cylindrical lanterns, lion dances, rabbit lanterns, glutinous rice figurines, and delicious moon cakes. According to village elders, nobody knows exactly when tanning became the Hao village’s traditional craft, but they are all sure that drum-making for children for the mid-Autumn festival has been shaped for more than 100 years. Villagers make both toy drums and big drums for schools and festivals nation-wide. The villagers mostly use water buffalo skin bought from other localities to make drums. Drum-barrels are made of bilinga wood, but they have recently turned to bodhi wood and canarium wood, because they are cheaper and easier to craft with. Other traditional toys like masks, lion heads, and uncle Tễu (a typical puppet in Vietnamese water puppetry) are handmade using cardboard, a material mostly made of old paper and boards. 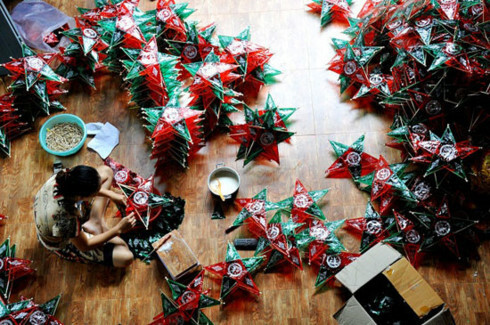 Hao villagers make mid-Autumn toys all year round, but are at their busiest during the sixth and seventh months, to prepare for wholesale to other localities. 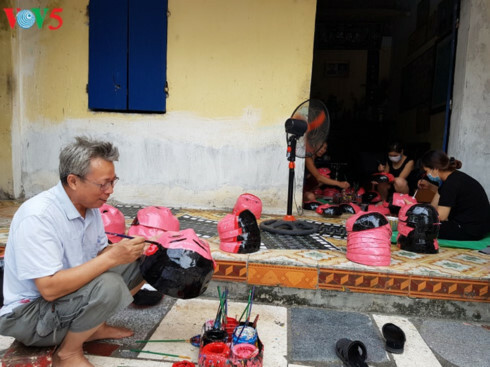 Villager Vu Huy Dong said though the village’s products must compete fiercely with imported items, local traditional toys remain highly sought after in the market and are widely known by foreigners. “Travel agents have taken many foreign visitors to my house. Most recently, we received a delegation of the English speaking community of foreign students in Hanoi, giving them the chance to learn about our traditional craft. The commune authorities have provided low interest rate loans to local households to help develop production. I have been invited to perform and introduce how we make our traditional products at the Vietnam National Village for Ethnic Culture and Tourism,” said Dong.